We all love our dogs – no one more than me; and it’s hard to have to leave our furry family members in a crate for an extended period of time while we work, attend family functions, or run errands when we can’t take them along. For many of those extended absences, depending on your pet’s bladder control, it may be very difficult to ask that you come home to a clean crate. Sometimes accidents happen and when you get home the last thing you want is to have to scrub out a crate and give your pet a bath because they had nowhere to lay except in the accident you are now cleaning up. Thankfully, crate designers have heard our cries for a better solution. Crates are now being made with dividers specifically for potty and housebreaking purposes. With so many pet crates on the market, which ones are the best? We’ve compiled a list of our top 5 best dog crates with potty dividers so that you can choose which one suits you best. 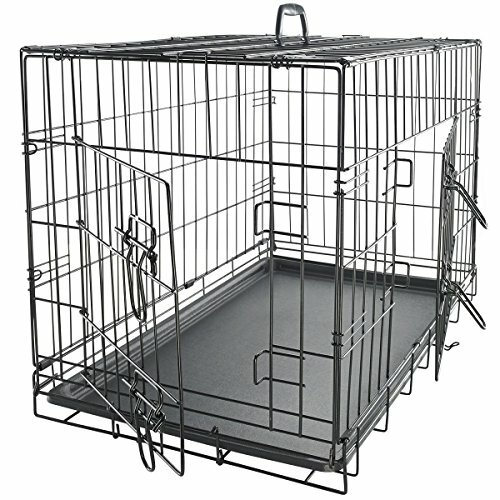 Designed for puppies and dogs on the smaller end of the scale (24” and up to 30 lbs) the Aspen Pet Puppy 2-Door Training Retreat Crate provides a great solution to housebreaking your new puppy; and the fact that the divider is adjustable allows your crate to grow alongside your puppy. 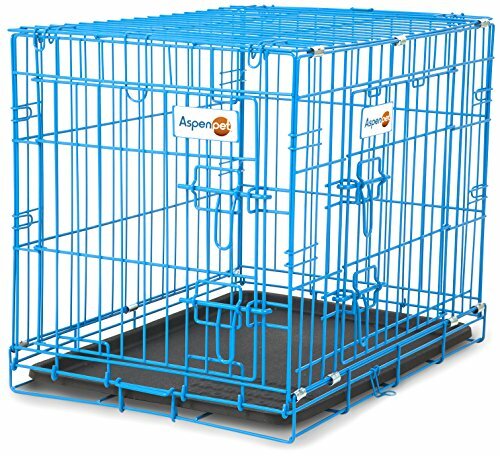 Ideal for correcting behavioral issues before they start, the Aspen Pet crate gives you a nice place to keep your pet while you’re away, preventing anxiety-related issues like chewing on the furniture, scratching up your walls and doors, or getting into kitchen cupboards or garbage cans. Lastly, the pink and powder blue coated crates offer an extended lifespan for your crate to prevent any rusting or other “weathering” type damages that can sometimes happen with exposed wire crates. 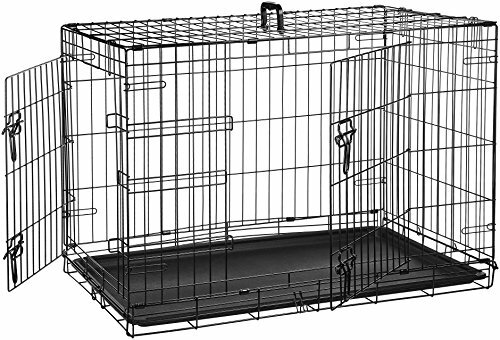 AmazonBasics provides the fourth best dog crate with divider on our list. Featuring both single or double door construction, this crate comes in a variety of sizes from 24” up to 48”. We personally love the double door feature because it doesn’t pigeonhole us into a certain orientation in our home. 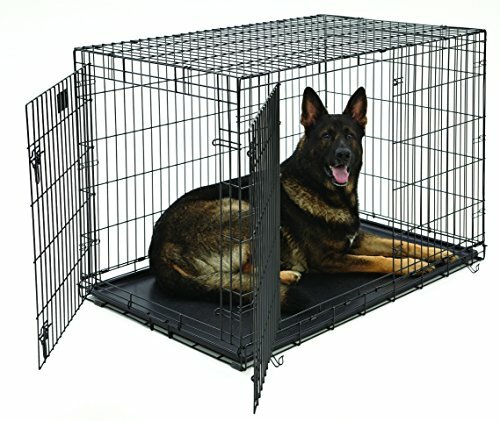 Whether it’s more convenient to access from the front or the side, you won’t have to worry about which wall your crate has to go against in order for your pet to actually get inside. In addition to the versatile divider panel. The AmazonBasics crate offers rounded corners and durable metal-wire to promote the safety and security of your pet. The open construction also gives your pet the best ventilation options available so they’re less likely to find themselves overheating in a more enclosed space in warmer months or climates. Finally, we love that this crate can fold relatively flat for easy storage when not in use, and it’s easy to adjust the handle to the side for storage to make it much easier to grasp on to and carry around. Designed with long term durability in mind, Paws & Pets has fashioned a double-door, folding metal crate that will keep up with your pet for as long as you do. Available in sizes from 20” up to 48” (please note the 20” size does NOT come with a divider panel), the Paws & Pets crates cater to any dog breed. Built from high density solid steel and finished in black electro coat, nothing is chewing through this crate except perhaps the jaws of life. Your dog will be safe and secure inside this model that also features dual latches on each of its double doors to keep them that much more secure. Most models also come with the divider panel so you can work on housebreaking and potty training your puppy and those will also adjust as your pet grows so that they can enjoy a much larger living area. 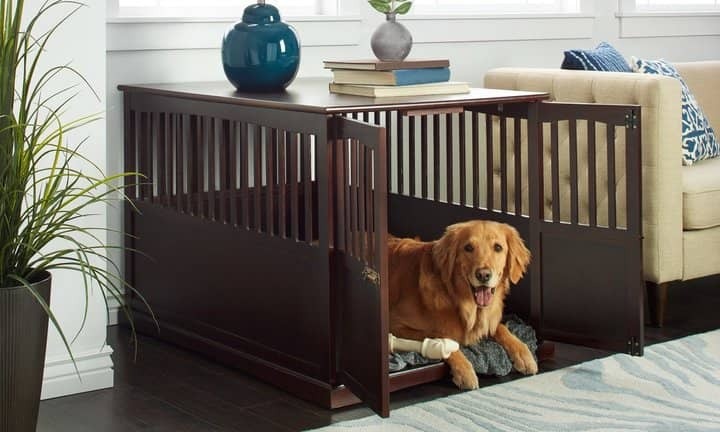 MidWest Homes for Pets has been in the industry for some time providing quality crating solutions to dog owners looking for a safe and secure place for their pets when they are away. Available in a range of sizes from 22” to 48” (all with divider panels) this crate is also available in both single and double door designs. One of the unique designs on the MidWest crate models is they include roller feet to protect your floors from any shifting or moving of the crate when in use. Constructed of a heavier gauge steel than most of the competition, the MidWest Homes Life Stages crate is designed to be the most heavy duty and secure dog crate they manufacture and when it comes to quality, they certainly deliver. If there is one thing that all the other products have in common, it is that they generally all look the same. Equipped with steel wire and removable plastic trays, most crates are not the most aesthetic looking things in your home, they are there to serve function and could care less about form. 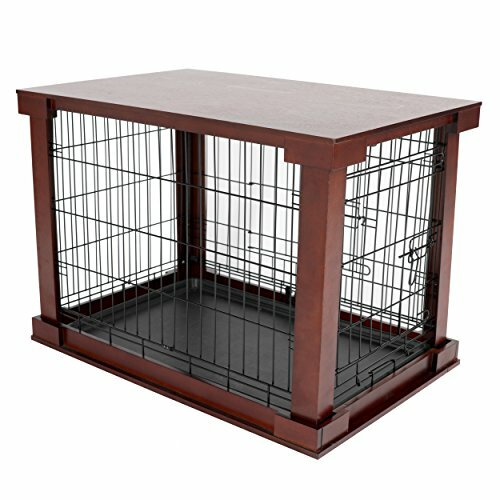 Merry Pet finds a way to accommodate both beauty and utility in their crate and cover set. Made with veneer wooden panels that cover the main components of the crate, the Merry Pet crate allows you to place your pet’s temporary home in any room of the house and allow it to look like it belongs there with its unique finish. Available in 3 sizes, Merry Pet is designed to fit everything from miniature schnauzers to labradors and everything in between to provide the best crate solution on the market. Certainly all of the dog crates we discussed will help provide your dog with a safe and secure place to be when you aren’t available to keep an eye on them. Ultimately, the one that does the best job of setting itself apart from the others is the Merry Pet crate. Having a large wire cage in a room of your home can seem unsightly and almost ugly, especially when not in use. The finished wood structure of the Merry Pet gives you the opportunity to keep your pet in your bedroom, living room, or any other area of your house and feel like you have a nice piece of furniture in your home that you can utilize in several ways instead of simply cramming a dog crate in the corner you’re not using much.